In 2006, Nicole and Peter Hartman were married and eager to start a family. Unfortunately, along with years of struggling with infertility, they lost three children, Caine, Lea, and Cara, to miscarriage. Not knowing how to grieve or what to do next, and feeling alone and without support from her faith community, Nicole felt Christ calling her to start a ministry for families who have faced the devastating loss of a child. Nicole approached Deacon Dennis Dorner about starting a ministry to support families who have lost a child from miscarriage, stillbirth, or infant death so they would not have to face this painful journey alone. In 2010, Archbishop Gregory endorsed this ministry in the archdiocese. “Embrace is a fitting title for this ministry since it reflects the yearning that parents who have suffered the loss of a baby would love to extend to that child no matter how long ago the loss occurred,” said Archbishop Gregory. Today, All Embrace, Inc. is an independent non-profit serving all faiths, surrounding families with God’s love through compassionate support, honoring the baby’s life, and integrating the loss into their family. 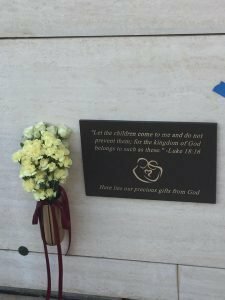 It has trained numerous priests, deacons and lay ministers, held memorial Masses, organized remembrance walks, led support groups for both moms and dads, provided miscarriage kits and burial boxes, and provided resources for all members of the family. All Embrace also provides complete burial and funeral support at no cost to families through the Embrace Mausoleum at Arlington Memorial Cemetery in Sandy Springs. In 2015 and 2016, All Embrace received grants from the Catholic Foundation. These grants enabled All Embrace to provide Certificates of Life to families who have lost a child and to publish training resources for clergy. The Certificates of Life signed by Archbishop Gregory provides a concrete reminder that the child’s short life is valued. Through support from a grant from the Catholic Foundation, All Embrace also published the Naming Ceremony, a small booklet for clergy and lay people to provide a ritual and text to follow to remember and honor the baby’s life. Nicole remains committed to ensuring that All Embrace continues to serve families in our archdiocese through celebrating life and providing loving support through faith communities. For more information, please visit allembrace.com. Nicole, Peter, and their 6 year old daughter Olivia, are members of St. Thomas Aquinas Catholic Church. If you are interested in making a gift to provide grants which help Georgia-based Catholic organizations such as All Embrace, Inc., click here.